What the right hand is doing. After the Delhi government allowed the pubs to operate, two departments are holding up permits for opening micro-breweries in the city. At the heart of the problem are antiquated laws that don’t recognise the new concept of micro-breweries. Under existing laws, brewing is interpreted as liquor making, a practice banned in Delhi. Many of the micro-breweries are now crying foul. 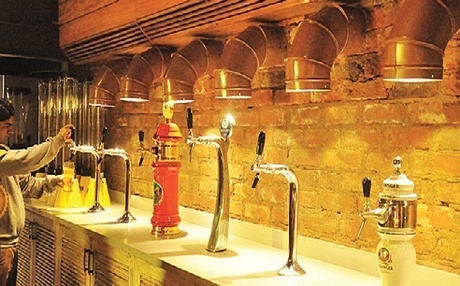 Ashwini Chaudhary, CEO of Soi 7 Group that runs the Striker pub in Vasant Kunj Ambience Mall said, “According to the state government policy, to get a licence we have to first set up a micro-brewery. Now that we have, it has been more than four months that the government is not giving us the licence to operate it.” Striker is the first micro-brewery in the capital. Rohi Jafa, managing director of Sino Trade Corporation, who has set up many breweries in India, including Striker, said that the Delhi Pollution Control Committee and the Delhi Development Authority is not providing the clearance due to major differences of opinion between the state and Central governments. DPCC and DDA say that brewery plants are banned in the city, hence they cannot provide clearance. Micro-brewery units of beer are non-polluting as the residual water can be used for watering plants, and the malt can be used as cattle fodder. The Delhi government has maintained that they are in the process of providing licences. Setting up a micro-brewery is far cheaper than a regular brewery.